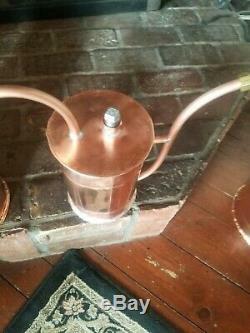 This is our Little Bit Three Gallon Moonshine Still. 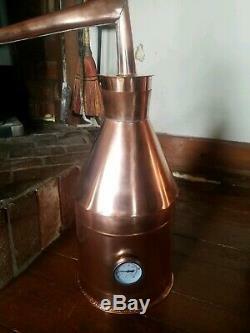 Completely hand crafted with sixteen ounce copper and lead free solder making it food safe. With a built in temperature gauge. 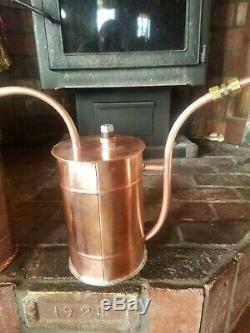 We have been building stills for over twenty years. 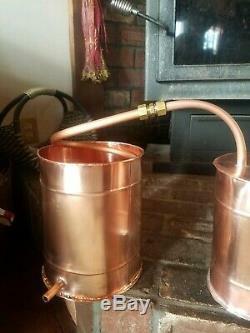 The three gallon boiler holds a full three gallons. It measures approximately 29 3/4 inches around by ten inches tall to the bottom of the cape. It has about a three inch opening at the top. 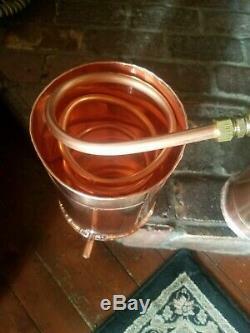 The thump keg measures approximately 17 1/4 inches around by 8 1/2 inches tall. It has 1/2 inch od. 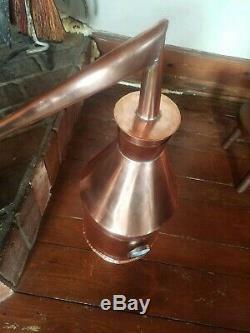 The condensing can is copper also, it measures approximately 23 1/4 around by 9 1/2 tall. It has an inlet and outlet line connector for kooling waters. Coil measures approximately ten feet long. The use of this product is in no way our responsibility. Using this item should be done so under all guidelines by the Government. Federal, State and local guidelines are the buyers responsibility. If you have any questions feel free to send us a message and we will try to answer as promptly as possible. 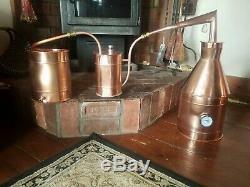 The item "Three Gallon Copper Moonshine Still With Thumper and Condensing Can by Walnutcreek" is in sale since Wednesday, March 13, 2019. This item is in the category "Home & Garden\Kitchen, Dining & Bar\Bar Tools & Accessories\Other Bar Tools & Accessories". 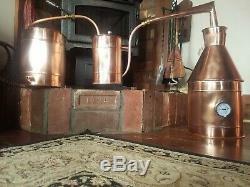 The seller is "pioneercopperworks" and is located in Metamora, Indiana. This item can be shipped to United States, Canada, United Kingdom, Denmark, Romania, Slovakia, Bulgaria, Czech republic, Finland, Hungary, Latvia, Lithuania, Malta, Estonia, Australia, Greece, Portugal, Cyprus, Slovenia, Japan, China, Sweden, South Korea, Indonesia, Taiwan, South africa, Belgium, France, Hong Kong, Ireland, Netherlands, Poland, Spain, Italy, Germany, Austria, Bahamas, Israel, Mexico, New Zealand, Philippines, Singapore, Switzerland, Norway, Saudi arabia, Ukraine, United arab emirates, Qatar, Kuwait, Bahrain, Croatia, Malaysia, Brazil, Chile, Colombia, Costa rica, Panama, Trinidad and tobago, Guatemala, Honduras, Jamaica, Viet nam, Uruguay, Barbados, Bolivia, Ecuador, Egypt, Iceland, Cayman islands, Sri lanka, Peru.